If it’s almost time for an oil change, be sure to get your oil changed prior to your road trip. It’s imperative that the old oil, which causes sludge in your motor, is extracted and replaced with clean oil, along with a new oil filter. It is good practice to change your air filter every time you get an oil change to keep your engine “breathing” well. 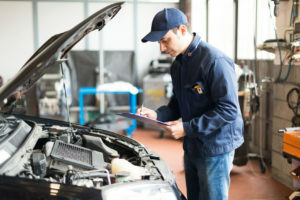 If you are taking your vehicle to an auto shop, you can ask them to check all of your fluids. Fluids like coolant, brake and power steering should be checked. Even making sure your windshield washing fluid is filled ensures the best visibility on your drive. When you’re ready to take a trip, the last thing you think about are your tires. However, it is important to know that the tire tread should be greater than 2/32”. Why? Well, when you are on the road for long periods of time, your tires heat up and can blow out if your tires do not have sufficient tread. How can you possibly measure to see if your tread is good to go? Simple. You’ve probably heard of the penny test. Put a penny in the tread, with Lincoln’s head upside down and facing you. If all of Lincoln’s head is visible, it’s time to replace your tires. Some say that you need 4/32” of tread to safely drive in rain, since depth from the tire treads allow rain to escape. The air pressure should also be checked in all tires, including your spare. You can find the correct tire pressure amount in the owner’s manual or on the door jams of the front doors. There is a number on the tires, indicating the maximum tire pressure for your tires–this number should definitely be checked if you have different tires from the manufacturer’s standard. Normally this is something you can’t do alone. Someone needs to sit in the vehicle and activate each light and signal while a person outside the car checks for functionality. If anything is not working, now is the time to fix it. And if you have a newer vehicle, sometimes a fix, like a headlight, can take multiple days if parts need to be ordered. Not only can an outage or malfunction cause issues while driving, but also can result in a fine from police.